Orchids were a passion for the new president of The Royal Horticultural Society as he took office in March 1885. His estate at Burford Lodge in Dorking, England, with its 12 greenhouses, was written up frequently in the horticultural press and it was often said he had the best private orchid collection in Britain. His mother, Louisa, had been an active gardener and botanist, and the new president credited her with stimulating his love for orchids. They were her passion, too. The Royal Horticultural Society was in great distress when the new president took over. It had considerable debt and not enough income to cover its expenses. It was clearly in crisis, and the 54-year-old president would have his hands full just keeping it alive. James John Trevor Lawrence was a handsome man, with a reassuring smile and a polished manner. He was known to the horticultural world as “Sir Trevor Lawrence,” but to his orchid friends he was just “Sir Trevor.” He was accomplished at many things. He had spent 10 years as a medical doctor in India, and 17 years as a member of Parliament. He had inherited the title baronet from his father, a former president of the Royal College of Surgeons, and his estate was a horticultural mecca. his grower, J.C. Spyers, was so accomplished at raising orchids that Burford Lodge was often the only place in Britain where many rare old orchids species could be found still growing vigorously decades after their first importation. Despite the magnitude and seriousness of The Royal Horticultural Society’s problems, it was soon evident they were no match for its inspiring new president, and before long, the gracious and charming Lawrence had turned the society around and started it moving forward as one of the great horticultural societies of the world. Lawrence remained president for an amazing 28 years, until just before his death in 1914. Along the way, a grateful horticultural world gave him the Victoria Medal of Honor, the Veitch Memorial Gold Medal, and so many orchid awards it was impossible to count them. The orchid world immortalized him naming Paphiopedilum lawreneanum and the lovely Cattleya lawrenceana, for him. Cattleya lawrenceana was discovered in 1884 by Frederick Sander’s collector Siedel, who sent many plants back to England. The first shipment perished, but the second arrived safely and was auctioned at Stephen’s Rooms, London on March 26, 1885. Sir Robert Schomburgk had encountered C. lawrenceana during an expedition to survey the Venezuela-Brazil-Guiana border in 1842, but C. lawreneana was not recognized as a new Cattleya species until Siedel’s 1884 importation. At the time of its discovery, C. lawreneana was considered an unusually lovely new species that was distinctly different from the typical large-flowered labiata-type cattleya. Like Cattleya labiata, C. lawrenceana has a single leaf at the top of the pseudobulb, but the psedobulbs are much shorter and thinner than those of C. labiata and most have a characteristic red hue. Although the flowers of C. lawrenceana can reach the size of a typical C. labiata, they are normally only half the size and have an unusually narrow tubular labellum. Because of this distinct labellum, C. Lawrenceana is one of the few members of the Cattleya genus that botanists have never disputed as being a genuine and distict species. Cattleya lawrenceana has one of the broadest ranges of color forms of any of the Cattleya species. The typical C. lawrenceana flower is pale to medium lavender in color with a dark rose-lavender lip. There are also very rare alda and semialba forms, pastels, dark lavenders and even dark, rich, flammea types like the one pictured in this article. Reichenbach flamboyantly compares the rich color of C. lawrenceana’s lip to the “end of the tail of a heathcock,” which is like my telling you it has the color of a Delaware Blue Hen- only a few local readers would understand what was meant. What Reichenbach tried to say was that, at its best, C. lawrenceana has a deep, rich, almost glowing royal purple labellum. Because the flowers are relatively small, but individually presented on a stem that normally has at least five flowers, C. lawrenceana is one of the most enchanting of all the Cattleya species. Cattleya lawrenceana ‘Diane’, with its delicate pale-lavender concolor flowers, is one of the most beautiful cattleyas I know. It does not have wide petals, round shape, or heavy substance, but it needs none of these qualities to be beautiful. Cattleya lawrenceana is native to the Gran Sabana area of eastern Venzuela, where Venezuela borders Brazil and Guyana. It has been founf on all sides of this border, but Venezuela is its principal habitat. The plants grow in forested areas, usually near streams or rivers, and are most abundant at elevations between 1,200 and 4,00 feet above sea level. The most famous home of C. lawrenceana is at the foot of the twin table mountains, Mt. Roraima and Mt. Kukenan, two picturesque plateaus in Roraima that rise almost vertically some 8,000 feet. These mountains are so distinct that a woodcut was made of Mt. Kukenan to accompany the 1885 article in The Gardener’s Chronicle that intrpduced C. lawrenceana to the orchid world. Cattleya lawrenceana is the first Cattleya species for which concern was expressed for its survival at the time off its discovery. One writer in 1885 expressed “…regret at the probable extinction in their native homes of such plants as this by their wholesale collection for market.” the famous Venezuelan orchidist G.C.K. 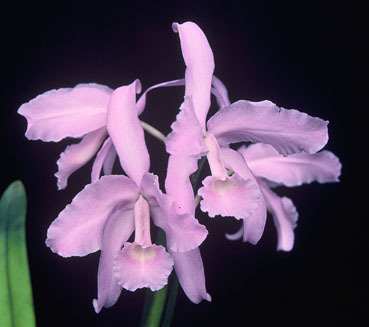 Dunsterville showed concern in 1973 and added the acid comment that, “When we speak of Cattleya lawrenceana the word ‘s’ may have to be changed to ‘was.’” Venezuelan orchidists today continue to sound the alarm for C. lawrenceana as this lovely species disappears from more and more of its native habitats. Even the Venezuelan government’s establishment of the huge Gran Sabana National Park in C. lawrenceana’s prime are has not stopped the collection of plants by local people for the tourist trade. Cattleya lawrenceana has had a limited and confused history in hybridizing. Sander’s 1946 List of Orchid Hybrids shows us that, in the early days of hybridizing, C. lawrenceana was crossed with a number of other Cattleya and Laelia species, three Brassavola species and Sophronitis coccinea (syn. grandiflora). There were only 17 other hybrids made, however, during this long period. Unfortunately, Sander’s shows no hybrids with C. lawrenceana for the next 38 years because, for some strange reason, they suddenly considered C. lawrenceana synonymous with c. labiata. This is astonishing, of course, considering how different C. lawrenceana is from all the labiata-type cattleyas. Finally, in 1984, Sander’s began listing C. lawrenceana as a separate species, but we find only three crosses made since then. Although C. lawreneana seems to intensify the purple coloring in its hybrids, the end result does not seem to recapture the tantalizing charm of the original. Cattleya lawrenceana is one of the rarest Cattleya species in cultivation in the United States today. The few plants I have were acquired many years ago, and I have seen only a scattering of plants for sale in the last 50 years. Fortunately, it is still possible to obtain plants from Venezuelan orchid growers and most of these, happily, are raised from seed in nurseries. G.C.K. Dunsterville called C. lawrenceana the “Queen of the Guayana.” The native Venezuelan Indians near Mt. Roraima called C. lawrenceana by a name that means “blossom of the wood.” I always think of C. lawrenceana as the Little Charmer. Its haunting color tones and abundance of unique flowers make it a captivating ambassador of springtime, and it is always gratifying to see a Cattleya named for someone who really deserves the honor. I have found Cattleya lawrenceana is one of the more difficult of the Cattleya species to grow well. It should not be given too much water during the winter months, when it is dormant, but should be watered with care at this time of year. It responds well to light sprays when it begins to grow, and can be watered heavily when at night temperatures are warm in the summertime. Cattleya lawrenceana benefits from as much sun and moving air as Cattleya warscewiczii, which may account for the reddish color of the leaves and pseudobulbs on most plants. I find it grows best when slightly under-potted, much as you would with Cattleya dowiana. Because of its small size, a 5-inch clay pot is large for this plant.